Favorite food: Blue Spa, Charlee Bears and DentaStix. Favorite toy: Mommy, Daddy, Angel Kisses, Josh and 2 kitties. Favorite activity: ZOOMING of course, with my sister, Angel Kisses and Josh, my bro. Sleeping with Jake my other bro. Protecting my family. Special talents: Jumping over gates when I am not supposed to and jumping straight up in the air about 3 feet. Taking care of the family, I am very sensitive about them. Most embarrassing moment: We were at my new Granmy's house and instead of telling Mommy I had to potty, I marked Granmy's fireplace. Most trouble I ever got into: Chasing kitties at home and scaring them. My favorite friends: My family. 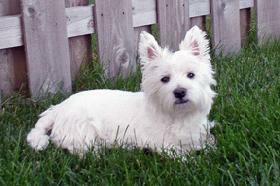 Sarah Kanter from Westie Rescue Missouri who helped Mommy drive to Racine, WI to rescue me. Tyler who is an American Bull Terrier (another WHITE dog)! Biggest adventure: Flying from England to Wisconsin and four months later going to live with my furever family, who I thought was only going to be my foster family. Leaving the people who abused me behind, and finding out I am a GOOD boy and deeply loved.